"Nature At Best," oil on canvas by Terry Sonntag, March 2012. 8x10 inches. 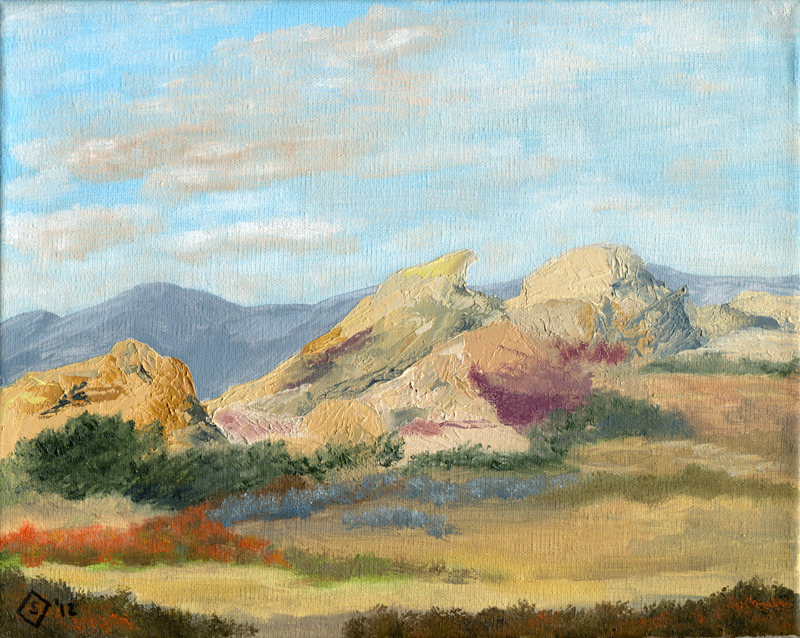 Vasquez Rocks, Agua Dulce, Calif.
Terry Sonntag, a longtime resident of Northern Los Angeles County, has been a connoisseur of antiques and fine arts for decades. His broad exposure from his antique business, professional development and antique appraisal practice guided him to a greater appreciation for California Impressionist oil paintings. Terry has taken brush and oil to canvas and panel to express his feelings in the style of the California artists that captured the feeling of early 20th century California Plein Air. These great artists sought the views of the Santa Barbara area, Laguna Canyon and Beach, Catalina Island, the Deserts, San Gabriel Valley, the High Sierras and beyond. 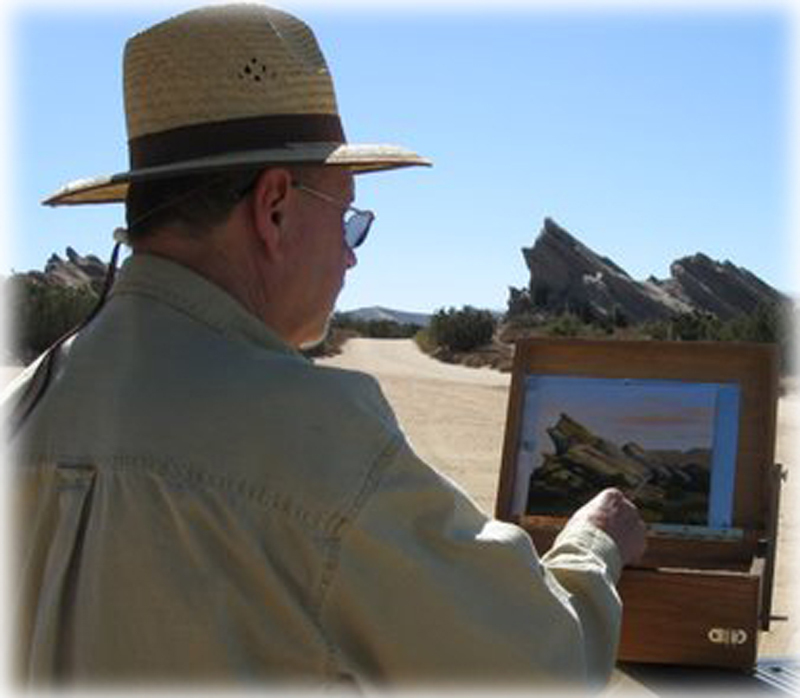 Having enjoyed the local landscape for decades, Terry expresses his feelings with renderings of the Santa Clarita and Agua Dulce areas, Vasquez Rocks, Saddleback, Davenport Road canyons, Placerita Canyon, the High Desert and Tehachapi area. He attempts to capture the visions of his favorite California artists; Edgar Payne, John Marshall Gamble, Franz Bischoff and many other landscape artists with rendering he refers to as "interpretive renderings." These oil paintings are small versions in the style of these artists. Terry's tributes are not exact copies and there is no intention to coattail their talent or infringe upon their rights. He has developed his own style and will often work from field studies and photographs he takes from various locales and work from his home studio. Terry also takes great interest in painting miniatures. These paintings are often on smooth hardboard panel and may measure 2"x3" or smaller. His paintings are signed with the initial "S" contained within a diamond in the lower left corner. The year painted is also shown. Paintings are available either framed or unframed. Terry is an active member of the Santa Clarita Artist's Association and the Bear Valley Springs Cultural Arts Association. You may wish to view some of his completed works in person. They are currently showing at the Country Antique Fair Mall in Santa Clarita, CA. This venue is an exciting trip into yesterday and features over 100 dealers under one roof and available for viewing or purchase 360 days per year. Feel free to stop by 21546 Golden Triangle Road for a pleasant experience. Contact Terry for more details or directions at 661 478-8935. Terry D. Sonntag has been an active collector, buyer and seller of antiques, decorative and collectible arts for over 40 years. He has been a dealer of antiques since 1968, working on a part time and hobby basis, at swap meets and with friends. In the late 1970s, he became a dealer in the Country Antique Fair Mall and eventually became co- owner and Operations Director of the 12,000 square foot retail antiques outlet. This was home for approximately 100 dealers of antiques and collectibles. To venture out into a new direction, he sold his interest in this business and established the Santa Clarita Antique Center; a 60 dealer retail antique mall. He retired from this successful business in 2004 to pursue his interests in antique appraising and continuing his education in the field of antiques, fine and decorative arts. He remains active in various marketplaces as a buyer, seller and consultant. In addition, he is an adjunct professor at College of the Canyons (Santa Clarita), in an unrelated discipline; 1991 to present. 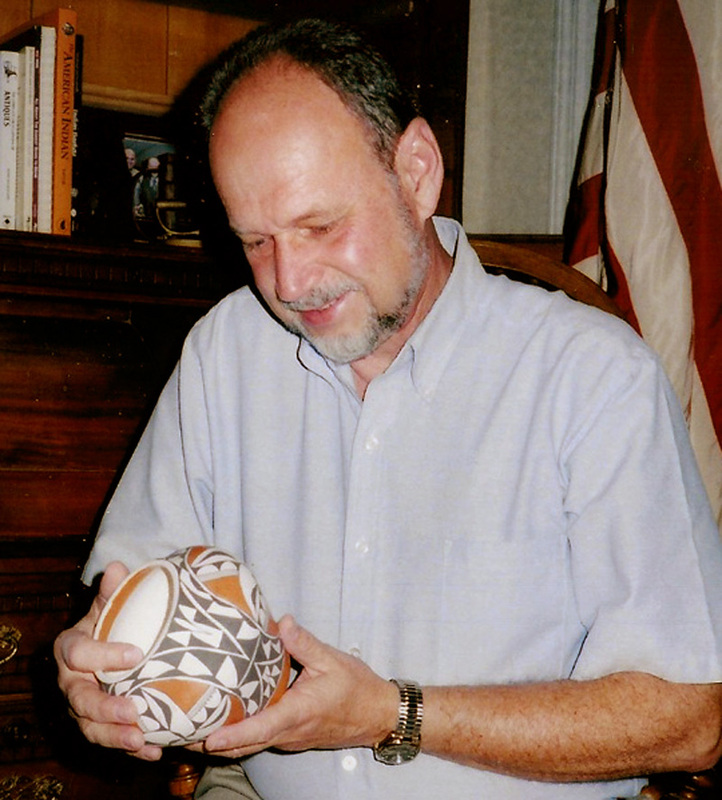 He facilitated Antiques Appreciation Seminars in the Santa Clarita area through the Community Extension Program, presented by College of the Canyons. He has been a part of the Santa Clarita Valley business community since 1970. Upon graduating from Citrus College in music, Terry continued his formal education at Cal State University Los Angeles, East Los Angeles College, Rio Hondo College, Chapman College and College of the Canyons. In 2010, he completed The Specialized Studies Program in Fine and Decorative Arts at the University of California at Irvine. In 2003, Terry was accepted as a part time assistant to William Novotny, a highly respected appraiser in the field of antiques, decorative arts and expert witness in said fields. Terry was mentored relative to the importance of accurate on site inspections, the correct approach to valuation and the ethical aspects of appraising and reporting. He still assists Mr. Novotny as needed with on site work. He became an Associate Member of the International Society of Appraisers (ISA) in 2004. Upon completion of the Core Course of Appraisal Studies, (affiliated with the University of Maryland), Terry was elevated to the position of Accredited Member, in the field of Antiques and Residential Content appraisals. In 2005, Terry joined Appraisers National Association (ANA) and has subsequently achieved the level of Accredited Appraiser. As of November 2009, Terry retired from the ISA. Recognizing the importance of education, he enrolled in a course of study in Antiques and Fine Arts at the University of California-Irvine and completed course work and achieved the Certificate of Connoisseurship of Fine and Decorative Arts. This program was developed for Appraisal Studies and meets the requisites of the American Society of Appraisers (ASA). He participates in educational programs affiliated with the ISA, ASA, ANA and the College for Appraisers. In 2007, Terry successfully completed the course and test for the Uniform Standards of Professional Appraisal Practices (USPAP), and is compliant with Standards of the Appraisal Foundation requirements as to Ethics and Competency. He recertified in 2010. In 2005, Terry was accepted as a member of the monthly Rose Bowl Antiques Appraisal Panel, which is sponsored by ANA. He also operates the monthly Appraisal Clinic at the Saugus SwapMeet in Santa Clarita. He participates with Antique Roadshow type events for charity fund raising, is a public speaker for community groups such as The Questers (an organization for the care and preservation of antiques), is a member of the Santa Clarita Valley Historical Society (SCVHS) and recently conducting a series of educational seminars sponsored by them at the Saugus Train Station located adjacent to William S. Hart Park and Museum. He conducted similar clinics in the Tehachapi area in a private studio. His workshops and programs are designed to be interactive, fun and educational. Terry makes every effort to visit antique and collector shows, swap meets, flea markets, auctions, appraisal events, antique malls and thrift shops to remain current in moving values and trends. He maintains an extensive personal research library and is connected with various online research sources viewing comparative values, current trends and market activity. His prior antique business knowledge causes him to be sought out by individuals and groups interested in start up advice and guidance. Independent from appraising, he also offers clients downsizing advisory to assist them in determining what to keep, sell, donate or toss. In the course of dealing with clients, Terry acts as a paid advisor and does not make offers to obtain or purchase their items and will not accept merchandise in lieu of fees. Terry is currently a student of California Plein Air oil painting and studies with Susan Taylor Tredway. LW2623: 19200 dpi jpeg from original painting, collection of Leon Worden.